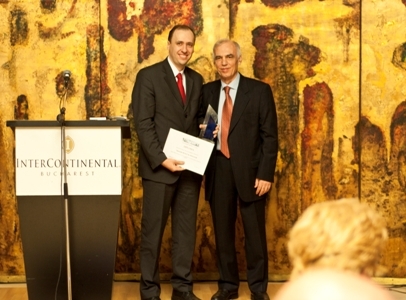 Muşat & Asociaţii received “The Law Firm of The Year in 2011” award at the “People of the Year 2011” Gala, organized by the sole English daily publication in Romania, Nine O’Clock. Nominated along with 5 other law firms, Muşat & Asociaţii gained the jury’s appreciation for its strategic vision proved in an increasingly demanding business environment. “2011 was a year highlighted by both challenges and opportunities in the Romanian market. Muşat & Asociaţii. managed to be actively involved in complex projects, developed by multinational companies. Our main objective is to maintain a high level of quality, by offering innovative, prompt and pro-active solutions to our clients, taking into account the current economic evolution. Our input represents an authentic support for the business of our clients”, stated Cătălin Băiculescu, Co-Managing Partner Muşat & Asociaţii. The “People of the Year 2011” gala has been organized for over 20 years by Nine O’Clock. The annual awards acknowledge the outstanding performances achieved by the diplomatic and business environment during one year’s activity. Among the personalities and companies who received the distinctions is the US Ambassador to Bucharest Mark Gitenstein, for Foreign Diplomat of the Year, Eximbank – Bank of Year, but also Asirom –Insurance Company of the year. In 2011 Muşat & Asociaţii assisted major companies, among which Mediterranean Car Company in the acquisition’s process of Autoitalia, Enel Green Power in the acquisition of a green energy project in the field of wind generation – Salbatica 2. The firm has also provided legal advice to Raiffeisen Bank International in connection with a EUR 71,500,000 loan facility granted to Bucureşti Turism. Furthermore, Muşat & Asociaţii has been selected to represent the Office for State Ownership and Privatization in Industry (OPSPI) in relation with the secondary public offering on the Bucharest Stock Exchange for 15% of Transelectrica and Transgaz shares, as well as in the privatization process of the chemical producer Oltchim.